After studying syst ems thinking for a few years in several guises, I finally got the feeling that I was on to something. Then, on the very last day of the year, I discovered this dusty old book on a friend’s bookshelf: Systems Approaches to Management, Michael C. Jackson (2000). 10 out of 400 pages on system dynamics, as part of a much broader field in which there is still so much to discover. For me this was yet another reminder to bring more diverse perspectives to the blog … good that the year has just started and that there is new inspiration on the horizon! Before starting into 2015 with renewed energy and ambitions, let’s look back at the thoughts and experiences that people shared here in 2014. What did we learn about so far? Within a good four months of founding this blog, we have had some amazing contributions from various authors about events such as the International System Dynamics Conference 2014, a workshop on the classical system dynamics study “The Beer Game” (by Julián Chacón) and a summer school on sustainability (by Conor Meehan). Sustainability is closely connected to systems thinking, as we can learn from the latest article by Carlo Cuijpers as well as from a note on Earth Overshoot Day. Besides looking at topics that can be addressed with systems thinking, we also saw how modeling can contribute to organizational learning (by Wissam El Hachem), what traps one should avoid when working with clients (by John Huertas) and why one’s own modeling work can be improved when integrating it with other methodologies. For the new year of Young Modeler there will be more exciting topics, such as interviews with the masters of systems thinking and modeling, which will be kicked off with a talk to system dynamics legend George Richardson (you really can’t say anything short of that). Moreover, people will reflect on the influence of systems thinking on everyday life and discuss hidden potentials of modeling. Follow us on this journey to new peaks and remember the credo: Don’t expect, suggest! 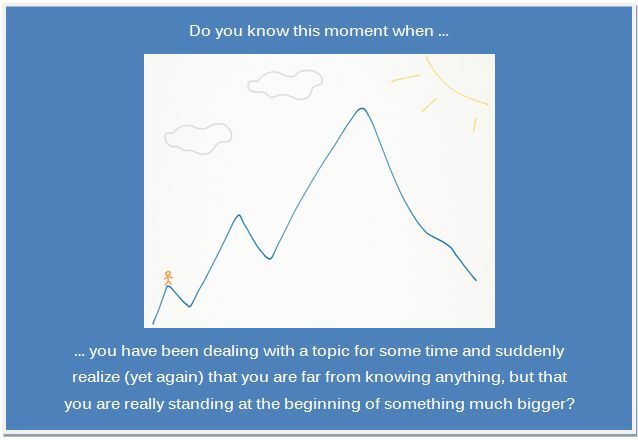 This blog is for all of you systems thinkers and modelers who know the feeling that you are just at the beginning of the path. A path that will lead you to deal with all sorts of challenges from which you will gain stunning insights – and sure will also get you the occasional bruise! So share what you learn from climbing to the heights of systems research and modeling and write about the new perspectives that you will gain.